Sort out in your mind the plants that will need frost protection in the coming weeks. It will be too late to get and wrap plants in hessian or move plants indoors once the frost warnings arrive. Being prepared will allow you to enjoy late autumn shows without worry. If your Busy Lizzies suffered this year, loosing leaves and flowering badly you are not alone. The fungal problems of Busy Lizzies are a concern so do not compost them and plan to grow something else instead next year. Hopefully a one year gap will kill off the problem fungus which is Busy Lizzie specific. Keep harvesting your runner beans before they turn woody and run to seed. Plant up your spring Daffodil bulbs. Tulips can be planted later. Indoor bulbs for Christmas flowering need to ‘be prepared’ or treated before you buy them. Hyacinth and Paperwhite narcissus are a couple of my favourites. Clean your bird feeding stations and plan to continue feeding through winter. I buy bulk seed and keep it dry. Look around for late flower shows and events. The Harrogate Centenary flower show is on 16-18 September 2011. Glee, the UK’s biggest garden trade event, is on at the NEC Birmingham on 19-21 September 2011. 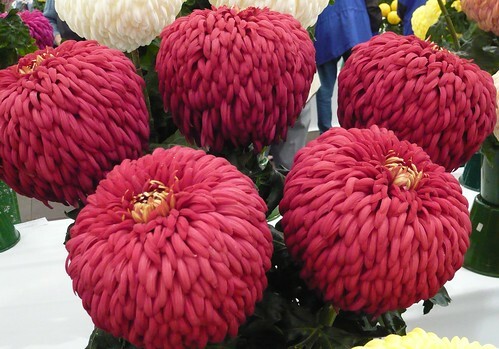 Pick a bunch of Chrysanthemums or Dahlias for the house.